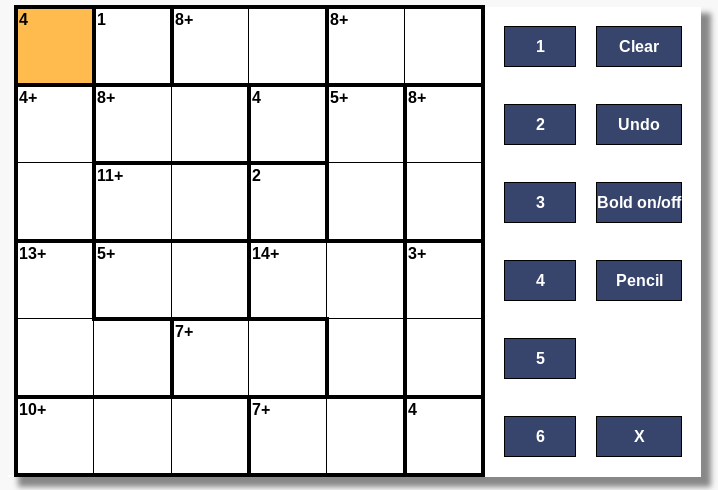 Calcudoku puzzle forum - View topic - new number pad? After some suggestions from user nailhouse (thanks ), I'm thinking of putting in a number pad like the one shown below. It'd appear after clicking in a cell, and stay open (closing only after clicking the 'X'). I will admit it has driven me nuts that the number pad disappears after I use Bold or insert an operation in the no op puzzle on Sunday. would you have to click on the "x" every time you filled a cell or just when you have finished the puzzle? You'd click on the X to make the number pad disappear. I do the majority of my solving on my phone. A 9x9, not to mention a 12x12 or 15x15, gets pretty small when the full puzzle is displayed. Adding a number pad to the side would further compress the display laterally, so I would be in favor of preserving the current 'floating' number pad. with an option to keep the old one in your account settings. test it out, any takers? I'm guessing it's not ready yet for the no-op puzzles (and maybe others). Thanks, & let me know how it goes.. It works well for me. I was able to solve today's puzzles (android tablet), quicker than before. Also for the sudoku, although I didn't finish that one. - putting on 'bold' on a cell that has numbers filled in using the pencil makes that cell empty. - when in pencil mode, there are 2 'x' s on the screen. Of course I did chose the wrong 'x' when trying to turn pencil mode off. - appearing of the new number pad is animated; for me that is unnecessary (and loss of time). - the layout of the puzzle is no longer completely 'smooth'; I'll try to email a screenshoot. So: very well done. I hope you will keep it this way.